Palestinian protests on the Gaza-Israel border have dropped off over the past two days, with Israel claiming it is due to Egyptian efforts to restore calm after dozens of Palestinians were shot dead Israeli forces. Gaza's dominant Hamas movement has denied that it was under pressure from Egypt to scale back the six-week-old demonstrations, and said they would continue. However fewer Palestinians are now gathering in protest tents near the border fence. 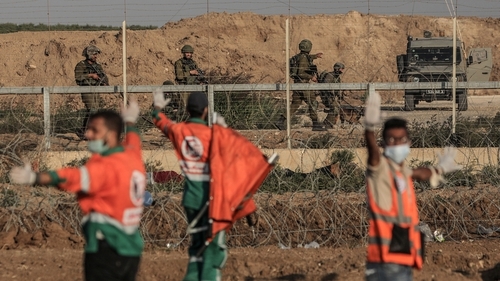 Medics in Gaza said two Palestinians were shot dead during yesterday's demonstrations along the 51km border. On Monday, 60 were killed in a far greater turnout on the day the United States relocated its Israel embassy to Jerusalem. Pushing back against foreign censure of its army's actions, Israel has - with US backing - accused Hamas of using civilians as cover for attacks across the frontier fence and to distract from Gaza's internal problems. Hamas denies this. Angered by the US embassy move and the Gaza bloodshed, Turkey has expelled Israel's ambassador and consul to Istanbul. Israel responded to its envoy's expulsion by expelling Turkey's Jerusalem consul. The Palestinian Foreign Ministry announced the recall for consultations of its envoys in Romania, Hungary, Austria and the Czech Republic, citing those EU members' participation in an official Israeli reception on Sunday for a US delegation that inaugurated the American Embassy in Jerusalem. There has been little Israeli domestic dissent at the lethal tactics around Gaza, where in the last decade Israel has fought three wars against Hamas, a group sworn to its destruction. Dubbed the March of Return, the protests were launched on 30 March to demand Palestinian access to family lands or homes lost to Israel during its founding in a 1948 war. Larger crowds have flocked to the border after prayers on Fridays. Israel and Egypt, citing security concerns, maintain a defacto blockade on Gaza which has reduced its economy to a state of collapse during more than a decade of Hamas rule and repeated war with Israel. Two million people live in the narrow strip, most stateless descendants of refugees who fled or were driven out of homes in Israel at the time of its founding. They suffer from what the World Bank says is one of the highest rates of unemployment on earth, and say the blockade makes rebuilding impossible. Gaza analyst Akram Attallah, pointing to the smaller number of protesters since Monday's deaths, said: "I can see there is a retreat because of the Israeli bloody response ... but Friday will represent an indicator to where things are going." Hamas leader Ismail Haniyeh made a brief visit on Sunday to Egypt, which has sought to act as a broker between the Islamists and other Palestinian factions, as well as Israel. Israeli Intelligence Minister Israel Katz said an Egyptian intelligence chief, whom he did not name, warned Mr Haniyeh that Cairo "knows and has proof" that Hamas was funding the protests and sending people to the border fence to serve "as living ammunition, women and children instead of shells and rockets". The Egyptian official "made unequivocally clear to him(Haniyeh) that if this continues, Israel will respond and take far harsher steps, and Egypt will stand by and will not help," Mr Katz told Israel Radio in an interview. "Haniyeh returned to Gaza, Hamas gave an order ... and miraculously, this spontaneous protest by a public that could not handle the situation any more dissipated." There was no immediate response from Egypt to Mr Katz's statements, which Hamas dismissed as false. "There is no mediation. The marches will continue until our people achieve their goals," Hamas spokesman Fawzi Barhoum said. The start of the holy month of Ramadan on Thursday, when Muslims abstain from eating and drinking during daylight hours, could limit the scale of the demonstrations. In a statement issued at a news conference, Palestinian factions said the fasting would be taken into account. They said marches would continue through early June. Organisers say the Gaza protests are civilian actions, noting the absence of Israeli casualties, compared to 107 Palestinian dead and thousands of wounded. Israel disputes this. The army said 14 of those killed on Monday were shot while firing on Israeli troops or trying to blow up the fence.